Only the state seal and state flag were approved before a Connecticut state flower was adopted by the legislature. The mountain laurel (Kalmia latifolia) was declared to be the state flower of the State of Connecticut by an act of the General Assembly approved on April 17, 1907. The following information is excerpted from The General Statutes of Connecticut , Title 3, Chapter 3, Section 3-108. Sec. 3-108. State flower. The mountain laurel, Kalmia latifolia, shall be the state flower. 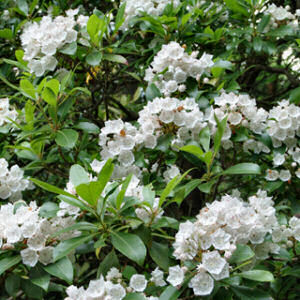 Kalmia latifolia (Mountain Laurel): Plant Encyclopedia from MyGardenGuide. Kalmia latifolia: University of Connecticut Plant Database of Trees, Shrubs and Vines. Mountain Laurel (Ericaceae Kalmia latifolia L.): Tree Identification Fact Sheet from the Virginia Tech. 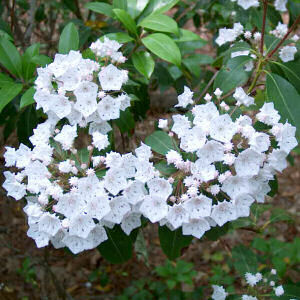 Plant Profile for Kalmia latifolia (Mountain Laurel): USDA, NRCS. 2004. The PLANTS Database, Version 3.5 (http://plants.usda.gov). National Plant Data Center, Baton Rouge, LA 70874-4490 USA.